Today marks the 23rd anniversary of Sitiveni Rabuka’s coup, a coup that brought into the tranquil backwaters of the South Pacific the use of might over right as a weapon to change government. Sure this had been the mode of choice in the good old days, but colonisation and refinement by the British was supposed to have changed this more than a century ago. And like all old habits, it was supposed to have receded into the mists of time. responsible self-government were left wanting on that fateful day as Fiji showed that it was not prepared to join the ranks of democratic nations and that there was still some learning left for its people. That was ultimately the unflattering verdict that Sitiveni Rabuka invited when he unleashed the coup genie at 10am on 14th May 1987. Fiji’s first coup involved a well orchestrated military operation. Firebrand Taukei Movement leader, Taniela Veitata, proclaimed “power flows from the barrel of a gun” as Captain Savenaca Draunidalo and nine masked, silent gunmen executed Fiji’s “treason at ten” that brought democracy to its knees in that pacific paradise that was once referred to as “the way the world should be” by no other than the Pope. Today marks 23 years after the fall of Fiji from that elevated pedestal from where when PM Ratu Mara walked into any international forum, the world took notice. This was, after all, the man who helped broker the Lome Convention between the ACP and EEC in 1975. And Fiji’s PM always walked tall and proud with Malcolm Fraser of Australia and Lee Kwan Yew of Singapore. Those were the days when Fiji had to be acknowledged. The fallout from that coup has kept Fiji both hobbled and crippled since that fateful day as an unprecedented exodus of the largely Indo-Fijian community began from a country that they had helped develop into what they saw as “home”. In the euphoria of independence just 17 years before, this same immigrant community had enthusiastically chanted and sung: Fiji desh hamaara hae, praano se bhi pyara hae. Rabuka’s coup extinguished that flame of feeling and passion that had been painstakingly nurtured through the tyrannical trials and tribulations of Girmit. Heart-wrenching farewells were made as tears flowed among unprepared families torn apart in an unexpected new search for a home outside Fiji. A lifestyle that had been built around the undulating green cane fields was suddenly not meant to be. Indian leaders, civil servants and sympathisers were hounded, seized and removed from their positions as an ethnic “balancing” exercise ensued in the civil service amid an environment of distrust, fear and hatred. Any advantage that could be exploited for personal gain was pursued with relish. Any dislikes or misunderstandings among neighbours both near and far were “corrected” as enough soldiers chose to look through only one eye. The hounding continued to Nadi Airport where those who chose to leave had to contend with embarrassing and demeaning clearance processes in a system that suddenly had too many gaps for abusive interpretation. Officials made on-the-spot rules to maximise discomfort and many still talk about the inhumanity shown among humans who appeared to have metamorphosed into demons overnight. The propaganda machinery in the meantime, went into overdrive as crass attempts were made to use race to justify the unjustifiable. Unfortunately the forcibly disturbed emotions did little to calm these necessary official encounters. And it would be unfair not to mention the many officials who did help in those tight times. Unfortunately the bad too often outshines the good in the human mind especially when it is outraged by a sense of unfairness. A bigger, oft-understated, fallout from that coup was the release of variant ambitious ethnic Fijian interests that suddenly realised that there were opportunities to be exploited. This is when the tightly glued Fijian traditional system began to haemorrhage with increasing speed. This is when the chiefly system was first defied, tested and diverted towards narrow political interests. The coup had spawned a plethora of interests, demands, expectations and more importantly, it brought to the centre a different type of Fijian bureaucrat/politician. It also centralised the role of the Methodist Church in Fijian politics. And of necessity, the demarcation between national government and the Fijian “system” was now as confused as ever. That was the source of the tightrope that Rabuka was forced to walk throughout his reign; that’s why he was always reshuffling his cabinet and making constant political deals. Ultimately that was what led to his fall from grace at the hands of the voters in 1999. Rabuka could not continue to please the myriad interests that he had spawned with his coup and strategically nurtured through his silently intensifying power tussle with Ratu Mara. The “coup culture” that Fiji finds itself saddled with was thus seeded by Lieutenant-Colonel Sitiveni Rabuka more than 2 decades ago. There is also a link between all of Fiji’s 5 coups so far, the most direct being between the 1987 coup and that of Bainimarama in 2006. Rabuka thus, stands in the centre of the creation and maintenance of Fiji as “Coup-Coup Land”. It is in this light that we need to evaluate his attempts at shaking off his Coup-Karma. There have been numerous reactions to Rabuka’s recent attempt at making a public apology for the 1987 coup. This time he took the initiative to approach the Tui Vuda, former President, Ratu Josefa Iloilo. Few realise that Ratu Josefa has direct links with Vuniduva, the seat of the Tui Cakau (one of Fiji’s 3 paramount chiefs) at Somosomo in Taveuni. There was therefore, obvious Rabuka-type strategy in this latest move. The Taukei Sawaieke, Ratu Tevita Momoedonu went to great pains to clarify that, “Rabuka did not go there to apologise for overthrowing the Dr Bavadra-led government, but to admit that what he did was wrong....It was up to us whether to pardon him" (FT 16/4/10). This is the type of attached provisos that have always characterised Rabuka’s initiatives. And this is what makes people skeptical about his sincerity. Some of the public reactions have been downright vindictive and unforgiving, but others have shown that we still retain what it takes to rise above the pettiness that enshrines the darker side of human nature. I do not wish to go through the more pronounced reactions here, but would like to emphasise that I doubt too many of these people have known Rabuka in person. I have. And like anybody who knows Rabuka, can vouch that he has that elusive yet priceless quality called leadership. Rabuka has such charisma that he can effortlessly take over a gathering regardless of size. I have no doubts that he had all the right intentions when he executed that Father of Coups in 1987. I also have no doubts that his attempts at seeking forgiveness are genuine – that is the nature of the man. Unfortunately, the web of lies and deceit that he weaved through all of his public pronouncements about that coup and subsequent developments in Fiji have come back to haunt him. 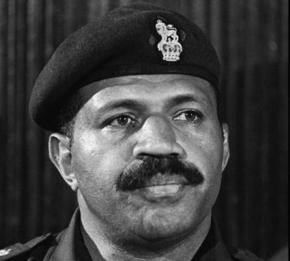 Rabuka was thrust into a situation that was thought to be well above his depth; at some stage he decided to take control of the political game that had rationalised the 1987 coup. And the fact that he successfully swam through it for 12yrs has to be credited to the man. That journey, which was initially meant to last for only a few days or weeks, called for the continuous plotting of a path for his political purpose once he decided to stay on. This is where the real legacy of Rabuka lies. He created a web of lies, a complex facade of truth to keep the aggrieved, angered and self-righteous hordes out and continue to appease the hungry factions that propped him. Fiji politics, which has largely been Fijian, continued in that vein – that’s what was being exploited by Qarase and his Gang. Coming back to the issue of forgiveness for Rabuka, no matter what model we apply, two factors stand out as pre-requisites for real forgiveness: the need for truth and repentance. I doubt that Rabuka will ever be able to tell the whole truth; his lies that beget further lies have entangled and strangled the truth too strongly. That leaves repentance. And that is what nobody can strangle Rabuka with; he is free to repent in the unending web of his lies. 23 years later much has changed; the Indian threat is no more, attempts are renewed at every turn to castigate and ostracise Fiji even from the Pacific fraternity. The un-neighbourly outbursts from Samoa are shocking at best. Any attempt to try to present a non-outraged position on the Bainimarama regime is seen as pro-coup and seditious. Where will the solutions come from? Do elections guarantee democracy, transparency and accountability in Fiji? Today marks the 23rd anniversary of the 1987 coup that transformed Fiji’s political landscape from one of smug complacence and acceptance to one of forceful denial of the tenets of democracy and the verdict of the voter through militant advocacy of the unfettered rights of a section of the community that could not comprehend the responsibilities that went with that elevated political positioning and has continued to refuse to accept the same. The trials for Fiji continue. i am fascinated the way you leave a system of government, judiciary,public service, military in place with all their checks and blanaces which have served many many countries very well, but you leave in the hands of fijians ...they mess it up... and blame everyone but themselves, it's aus , uk, us, indians fault but don't seem to reflect that every time they have bastardised these instituions and made thier own modifications ... they screw it up and cry foul beacsue everyone else doesn't appluad their efforts. Oh and then have their hand out for more financial assistancer to correct their own issues. Over to you China.Please don't bleat on about fiji being unique... it no more unqiue than maldives, botswana, south africa, costa rica, etc etc who manage their affairs without this self serving justification of a military push for ultimate power. I guess the cause lies much deeper that what Appana has portrayed. It goes back to the colonial era and government policies (with the assistance of Sukuna)isolating the indigenous to village existance and servitude to chiefs. When the Indo Fijians gained their freedom to pursue personal gains through employment, business and education the Taukeis were still in the village and needed a permit to go to town or work. That effectively sealed the fate of natives to catch up mode. The Indo Fijians were by Independent miles ahead in all fronts while the eyes of the commonner natives were just begining to open. Sukuna and the colonial government effectively put power into the hands of a handful of chiefs who later became the elites of the Taukeis. The defeat of the so called elites at the hands of Bavadra and Labour (the now educated native commoners)forcrd the elites to act to save what they can from their crumbling empire. The rest is history and Rumbo at the centre of it all. Rambo already benefited greatly from starting the first coup. He has only apologised because his entitlements etc has now been cut. Why didn't he apologise all these years if it was genuine? And of course he has gone to his big cozy house in his village which he used taxpayer money to build and have all the flash amenties.